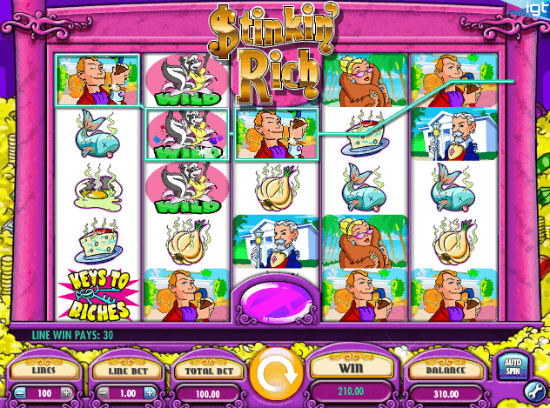 Stinkin Rich is a colorful video slot that easily lives up to the billing, since this is probably one of the best games to play if you are on the lookout for life-changing payouts. Clearly designed for the high rollers, this IGT slots machine supports wagers up to $1,000 per single spin and it goes without saying that it is not for the faint-hearted. Featuring five reels, as many rows and no fewer than 100 paylines, Stinkin’ Rich slot machine comes with $1 minimum line bet, meaning that casino gamers will have to stake at least $100 per spin if they want the maximum number of lines to be active. Hence, you should only play the game if you are absolutely certain you can afford the hefty bets, and if you do decide to give it a go, there could be some mind-blowing payouts heading your way. We have also enjoyed the cartoon-style graphics that are truly top-notch. Btw, if you are looking for games with lower bets, please check our penny slot machines section. We like the fact that the game offers different set of symbols for the main game and bonus round, with one of these paying up to 10,000 per payline. Obtain three Trash for Cash icons anywhere to trigger the main bonus round and receive a payout of 6x to 40x total bet. Alternatively, hit three Keys to Riches symbols on a payline and 5 free games will be played. Players also have access to Scatter wins corresponding to 3x, 20x and 100x total bet when three, four and five Scatters occur in any position. Arguably one of the best slot machines developed by IGT, Stinkin’ Rich is all about the big wins, but we have to warn you that only the high rollers will be able to afford the exorbitant stakes. And if you are one of these VIP players, then chances are you will enjoy a hugely rewarding gaming experience, especially if you should be so lucky to also turn a nice profit in the process.